Port Townsend, today. This photo is found on my refrigerator door. A raving classic of a young lady posing on her motorcycle. Check out the leather boots. The hefty gloves with wide gauntlets. The jaunty cap. On the fuel tank, I can barely make out "Indian Chief." The passenger seat behind her looks precarious. And I wonder, what is the rectangular can beneath her seat? Conjures up the '50's classic, "The Wild One." But this picture was taken 20 years earlier. On the back of the photo is a penciled notation; "Malahat, May, 1929." The "Malahat" refers to a First Nations people who lived in the high hills north of Victoria, B.C. The section of the Island Highway passing over that passage is known as "The Malahat." 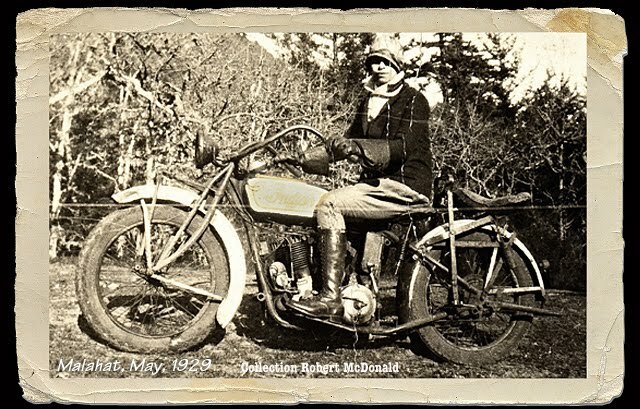 In those days, she was probably considered "a wild one," roaring up and down Vancouver Island on that machine. That young lady is my mom. As a teen, she herded cows on horseback on the McCrea Ranch outside Victoria. She was in training to be a concert pianist. She was team captain the Victoria High School basketball team. In later years she never missed a Seattle Supersonic's game on the radio. One did not call home when there was a game on the radio. As a young woman, she loved riding the tugs my dad worked on. In fact, mom cooked on a tug my dad worked on one summer in BC. She took on the Catholic priest at Esperanza, who wanted the Indian women to forsake some of their cultural behaviors. The native women, whom she worked along side with in the canning loft for several summers at CeePeeCee, adored her. As a Mom, she was strict, but allowed my sister and I room to grow. She was a Brownie Guide and a Cub Scout mom. She was president of the AquaVista garden club, and taught kids arts and crafts at Lincoln Park in Seattle in the summer time. When we lived in Prince Rupert, my sister and I would take bundles of newspapers and magazines down to crew members aboard a ships loading grain at the Government Elevator. We'd spend an afternoon exploring the bulk carriers from engine room to bridge, and invite crew members off grain ships up to the house for dinner, unannounced. There was no TV in Prince Rupert. As a family, we relished an evening of listening to seafaring stories as the grateful mariners unwound. When I asked permission to ride with the freight train crews up to Terrace, the only proviso was I wear a warm jacket, and eat my Malt-O-Meal before departing. And she woo-hoo'd right along as the passenger train blew out of Prince Rupert at dinner time, a few short blocks from our house. One of the engineers she dubbed "Tex." Tex did a wonderful tattoo on that steam whistle (4-6-2, 51-hundred series) all the way from the station up past our house over the last grade crossing in town. I still get goose bumps more than 50 years later recalling that salute. You can't do that with a Nathan air horn. The other engineer she assigned a less flattering name. He followed the Rule Book precisely with just the requisite grade crossing sequence. We were not a rich family by any means. Nevertheless, mom taught us the fine art of proper silverware placement at the table, to chew with our mouth shut, to listen more than we talked. Those were the days before latchkey kids. It was neat to get home from school and smell fresh baked chocolate chip cookies, or home baked bread. In addition, sit down dinners - as a family at the kitchen table. No TV. Yet she never got the hang of making edible dumplings. The darned dog got us in trouble, walking around the kitchen trying to deal with a gooey dumpling, which we had forked under the the table, stuck to the roof of her mouth. She encouraged books and reading. We always got books at Christmas. One year, she gave me a set of tickets to attend the "World Cavalcade" of adventure lecture films and talks. And the National Geographic. As kids, my sister and I were encourage pet ownership, and how to take care of various dogs and cats and gold fish and parakeets we had at one time or another. One of our cats cleaned out a fish bowl, which ended that stewardship. We came home from church and found an overturned fishbowl. And our cat, basking on the front room window ledge. She was outspoken on politics. But, she was not good at politics. When I ran for class president in the sixth grade, my loss was doubly humiliating because my mom had been my "campaign manager." She was outspoken in church and the PTA and the condo association, and always carried her little brown hard copy of "Robert's Rules of Order" to those meetings! She loved Bruce Williams (inducted into the Radio Hall of Fame in 1999) and I think some of his wisdom on finances paid off for her once or twice. When my business partner and I decided to start a video media production house in the mid-80's, while venture capitalists and the banks denied us loans in an atmosphere of double digit inflation and tight money, mom believed enough to purchase a block of shares we sold to friends and former work associates. None of them ever read the business plan we so meticulously wrote. At our first shareholders meeting, we handed out dividend checks to our trusting group of 12, including mom, who readily wrote out checks that got our business going. In our first year, we earned enough to pay back every shareholder loan, with 12% interest added on, plus a hefty dividend. Mom, who was a total stranger to the group, looked at her check and proclaimed aloud, "Well, I have a fist full of defaulted stock in Marble Hill nuclear power, and here's this start-up, paying off like a slot machine!" I could tell my partner was looking at me, but I avoided his glance. She was hard-wired to Dad. On more than one occasion, I remember her waking my sister and I up in the middle of the night as she paced the hallway. All she would say, in a calm voice, "pray for your dad." 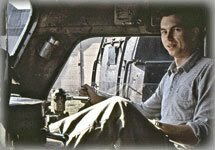 For several years he worked on a rig towing Davis Rafts up in Alaska. After being gone for several months, he would return with fascinating stories. Then he would tell of a terrible night on the Gulf of Alaska as they dragged that mass of logs into Yakutat seeking shelter. And I'd get goose bumps. My dad never completed grade school. But I remember the two of them laboring away for hours at the dining room table for weeks, as she helped him learn algebra and cosines, as he studied for his engineers license. He earned an Unlimited Horsepower Chief Engineer license. Now to be honest, we did not live the lives of Ozzy and Harriet nor did our home life resemble that of the Cleaver Family. We had our moments of pure drama. But those times I'd as soon as keep private - remembering that mom always impressed upon me to "Praise in public, chastise in private." I remembered that mom on her birthday last week. Thanks for sharing this Robert. It was a very engaging summary that really told me a lot about your Mom. I wish there were more no nonsense people like her in our world today. Thank you for this wonderful article. You really have a flair for writing.